The riot came on the day the incoming head of the Anglican Church, the Rt Rev Justin Welby, launched an initiative to promote religious tolerance in Nigeria. Religious clashes have claimed thousands of lives in Nigeria since military rule ended in 1999. The militant Islamist group, Boko Haram, has also been waging an insurgency since 2009 to impose strict Sharia across Nigeria, which is roughly divided between a mainly Muslim north and a Christian and animist south. Nigeria's Kano state police chief Ibrahim Idris said "misinformation" had triggered the riot, AFP news agency reports. "Rumours went round that someone blasphemed the Prophet [Muhammad] and there was a breakdown of law and order," he is quoted as saying. The BBC's Yusuf Ibrahim Yakasai in Kano, the main city in northern Nigeria, says that a heavy contingent of soldiers and policemen have been deployed to Bichi to restore order. It is a small town about 30km (18 miles) from Kano. Mr Idris said the riot broke out when a Christian tailor mispronounced the name of a dress while chatting with his Muslim neighbour in Hausa, the main language spoken in the north, changing the meaning to "the Prophet has come to the market", AFP reports. Angry Muslim youths then attacked Christian-owned shops, looting and burning them, he said. Residents said four Christians were killed, but Mr Idris could not confirm this. Our reporter says some residents gave him a different account of what caused the riot. They told him that a Muslim crowd first attacked a Christian man for wearing a T-shirt that they alleged blasphemed against the Prophet Muhammad. 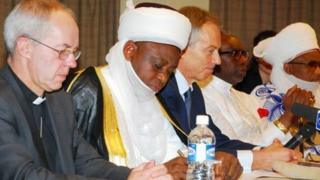 In the capital, Abuja, Bishop Welby joined Nigerian Muslim and Christian religious leaders and former UK Prime Minister Tony Blair to launch a campaign to promote religious tolerance. The Tony Blair Faith Foundation - which organised the programme - got students from Christian and Muslim communities in Nigeria to chat via a video link with students from different faiths in the UK city of Derby. Bishop Welby is a former oil executive who will become the Archbishop of Canterbury in March. He has visited Nigeria 70 times, and was the special envoy to Africa for the outgoing Archbishop of Canterbury, Rowan Williams, who is stepping down after 10 years in the role.